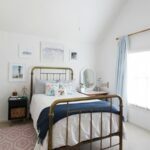 So, I admitted during the Young Modern Vintage Bedroom that I had one project in particular that totally stalled the makeover. 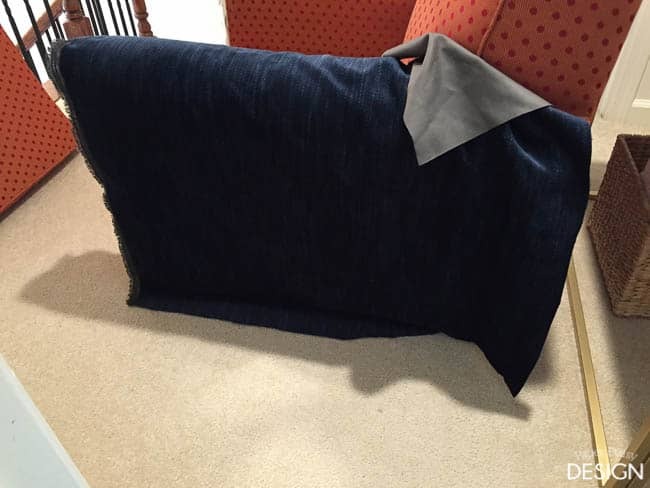 It was the big, navy velvet elephant in the room. 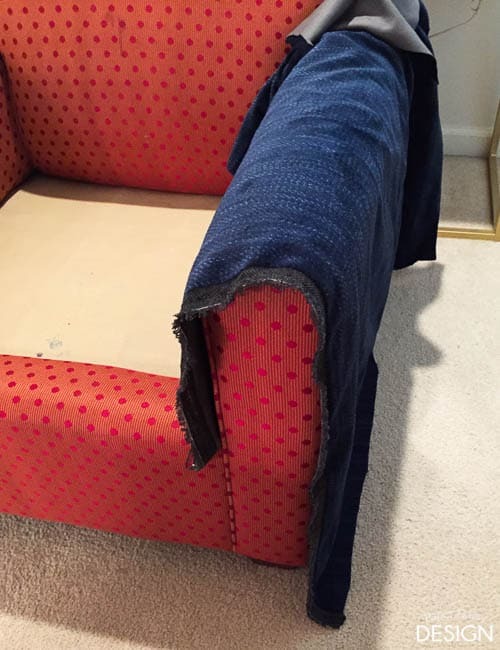 Literally, this chair sat in the corner with the fabric draped over it for almost a year. I finally started work on it in March. I’d say that was DIY procrastination at it’s best. I’m not going to lie, re-upholstery work of this size is not a fun job. But when the project is done, the reward is a great looking chair and all you can think about is the money you saved. Sooner or later you forget you never wanted to do this again. Right about the time you score another bargain chair you just have to makeover. Kind of like childbirth, no? Here’s where I tell you How I Cheated. 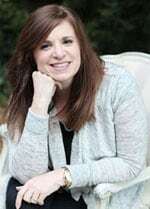 This is the before photo. Pretty scary right? But the fabric was in decent condition. It didn’t smell or anything like that. 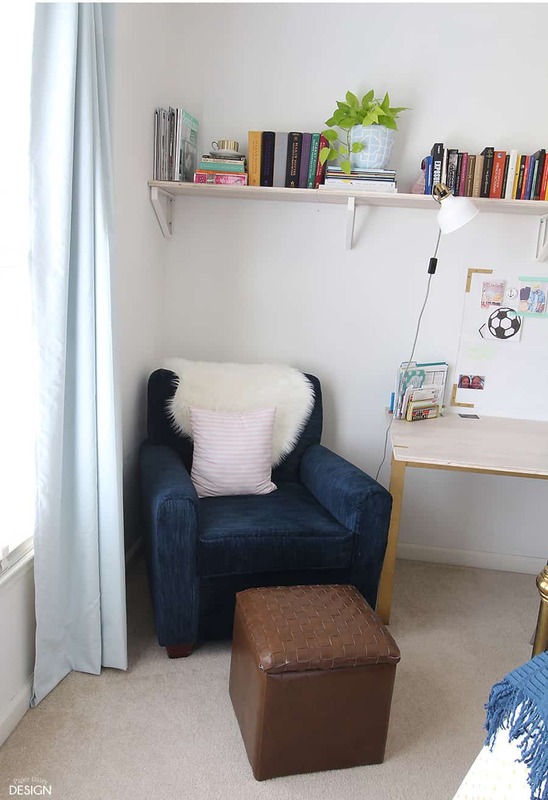 Remember, it sat in her room for nearly a year. 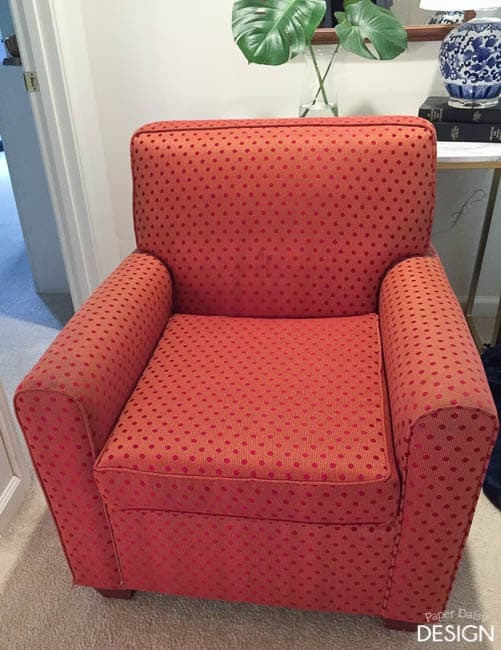 Because I was using a heavyweight, velour type fabric, I didn’t have to worry about the bright orange dots showing through. So did a combination of slip covering and upholstery. I think that’s considered cheating. If you want to be a cheater too, here are the steps. 1. Start with the arms. They always seem to be the hardest. Cut two pieces that will drape over the arm with overhang on both ends. Be sure you also have enough fabric to wrap around to the back edges. Here’s a look at it from the side. 2. 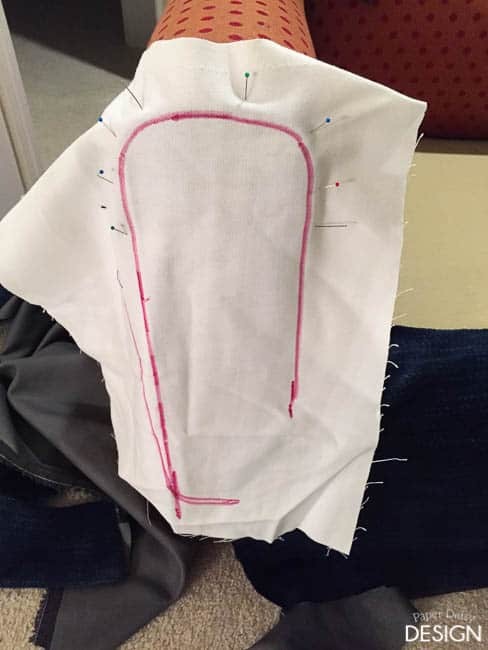 Next make a template for the face of the arm with scrap fabric and a marker. Use this as a guide to cut your fabric. This is especially helpful when your fabric is very thick. This is not a place I recommend cheating. 3. 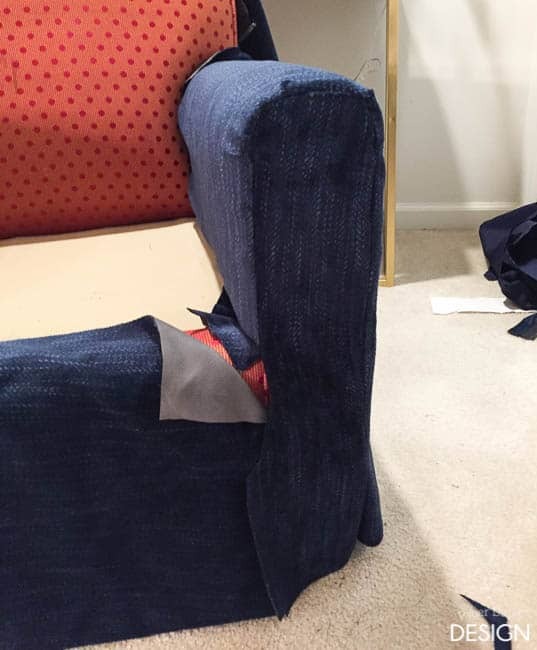 Turn your fabric so that the right side of the fabric is facing the chair. 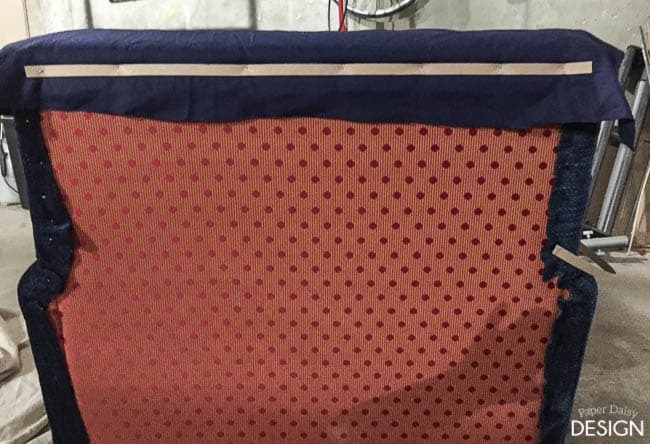 If your fabric has a backing, you can even trace the edge like this. Use this as a guide to pin you arm face to the side arm piece. It also served as a guide as I was sewing. 4. After sewing them together, move on to the second arm. Repeat pinning, remembering to turn the fabric inside out. 5. When you are dealing with extremely thick fabric, don’t be surprised if once you turn it right side out, that it doesn’t look just right. With a seam ripper, remove the stitches where the fabric isn’t laying flat or not going around the curve of the arm as it should. Re-pin and sew again. Don’t give up. Once you get this part done I promise it gets easier. 6. Next you will pin the bottom face of the chair or the apron, to one arm and sew. After it’s sewn, try it on the chair and check for puckering etc. I’ll show how to attach the second arm to the apron in a minute. 7. Now you are ready to create the seat back. Cut, pin and sew the front to the sides. Always remember to work inside out. 8. If necessary for your chair, attach a top piece of the chair to the front and sides. A white wax pencil was handy to mark dark fabric. 9. 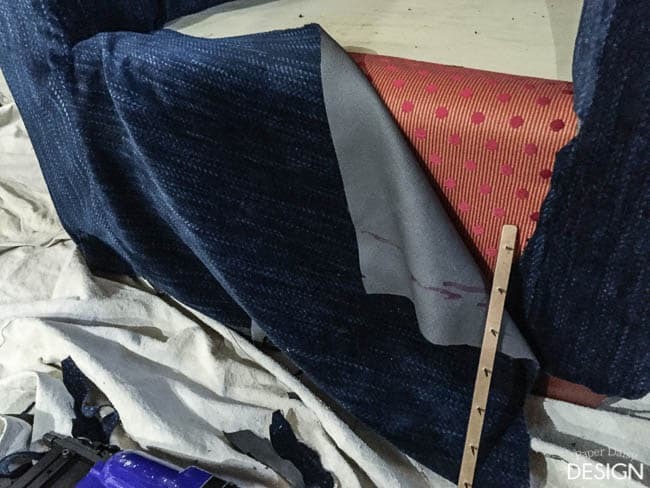 With all of the front pieces of the seat back sewn, you are ready to start putting everything together. Turn your seat back right side out and slip it onto the chair. 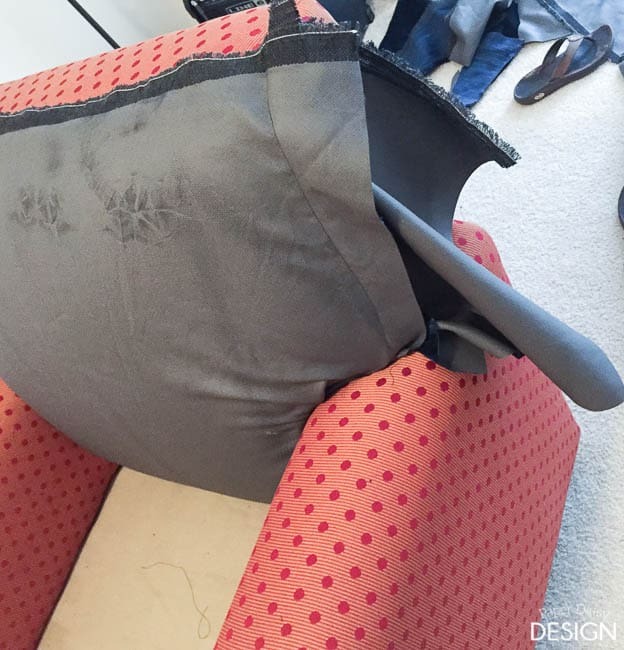 I was lucky there was plenty of space to tuck my fabric rather tightly into the arm of the chair. The fabric also had a vinyl backing that kept it from slipping. I used a blunt end of a thin paint brush to push the fabric deep into the crack. 10. 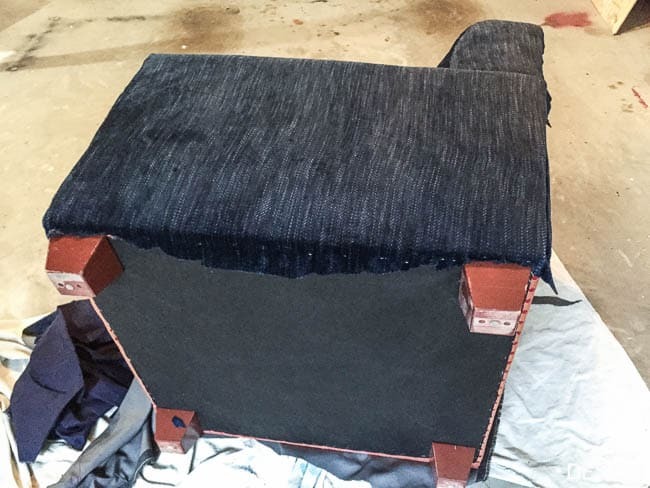 With at staple gun, staple all of the front pieces to the back and bottom of the chair as shown. 11. Cheater step: I had a great deal of trouble connecting the apron of the chair to the opposite arm. So, I used Upholstery Tack Strips, with nails built in like these. 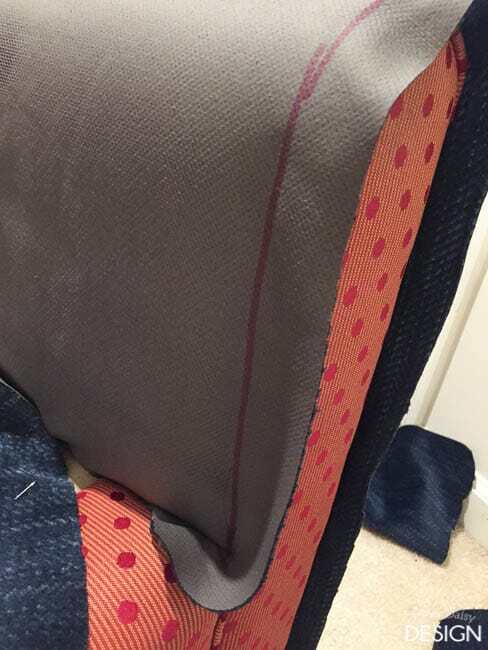 But first I added a few staples where the fabric of the arm of the chair and the apron met, being careful that the staples would be be covered by the tack strip. 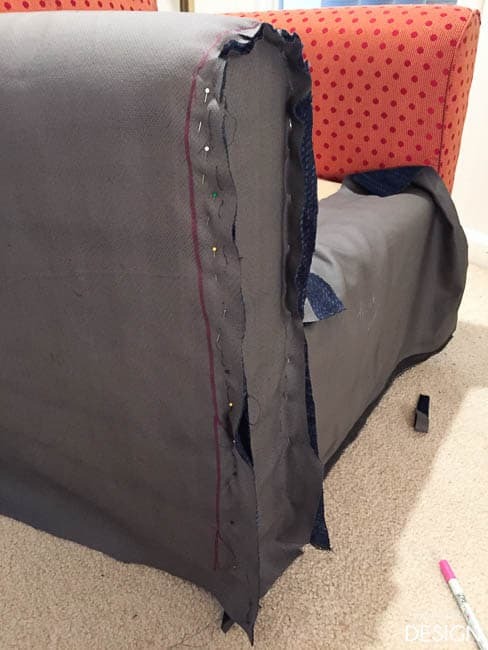 With the nails facing you, position the tack strip with the fabric underneath. 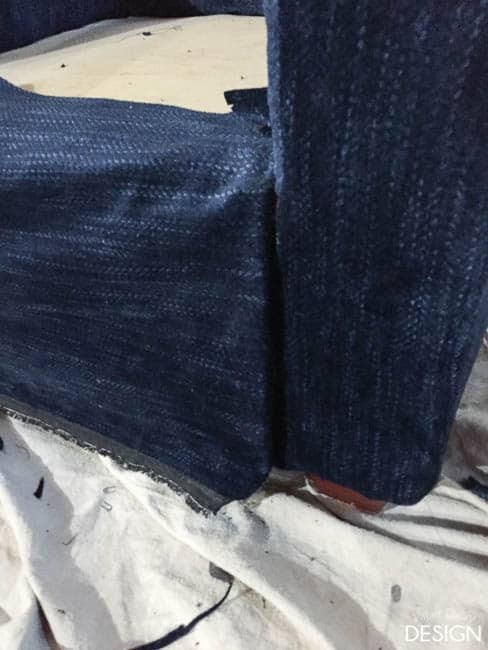 Without pushing the nails in, you’ll want to test the fit so that fabric will roll over to make a perfect seam. 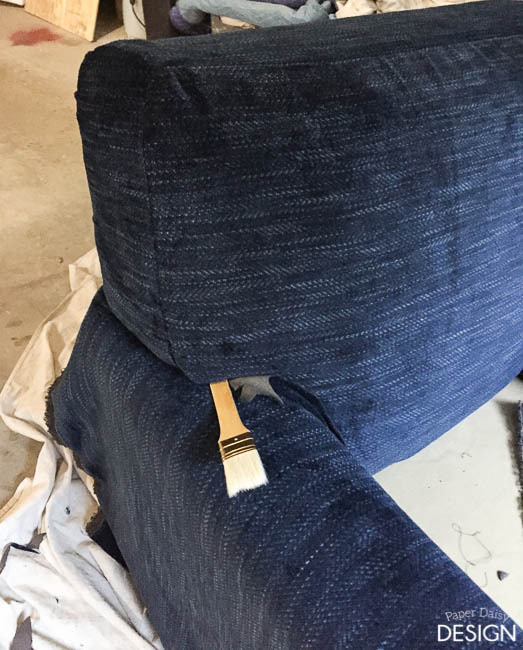 Once you feel like the positioning is correct, carefully begin to push the nails through fabric and then roll the nail side into the chair. Using a rubber mallet, hammer the nails in to secure the strip to the chair making a nice seam. 12. Staple the top part of the apron to the chair, as well as, around the bottom and back of the chair. Pulling the fabric snug. 13. Cut the back piece of fabric. This is another place I cheated. I knew going into this project that I did not have enough fabric to do the whole chair. It was from a remnant table with no way to reorder. So I purchased a lighter weight fabric that was the exact color match and used that for the back. We knew the chair was going to be used in a corner so we weren’t concerned. 14. 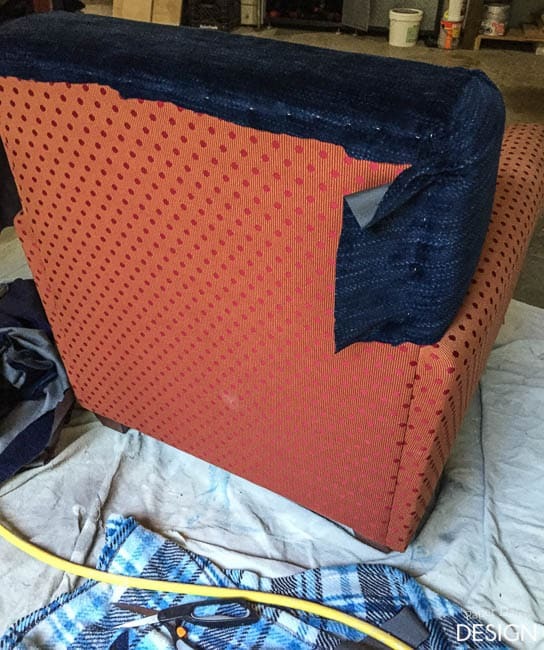 Drape the fabric over the front of the chair and add a upholstery tack strip. I just used the plain cardboard stuff this time. Staple the strip in place and then flip the fabric over. 15. 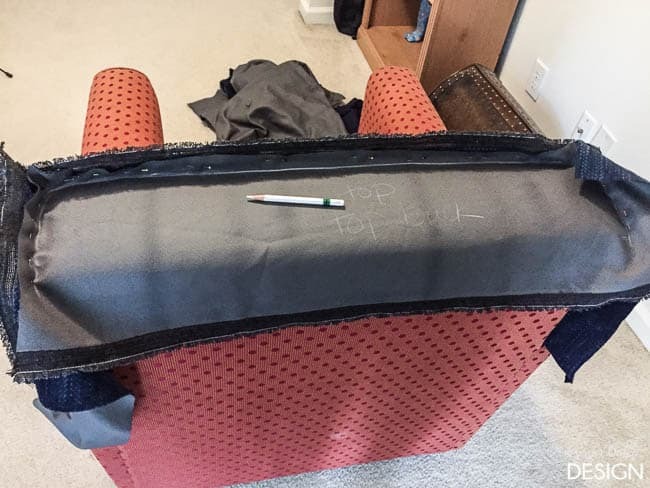 Continue to use the tack strip, working along the sides of the chair and staple down as you go until you get to the bottom. Securely staple. 16. All that’s left to do is sew a box cushion. 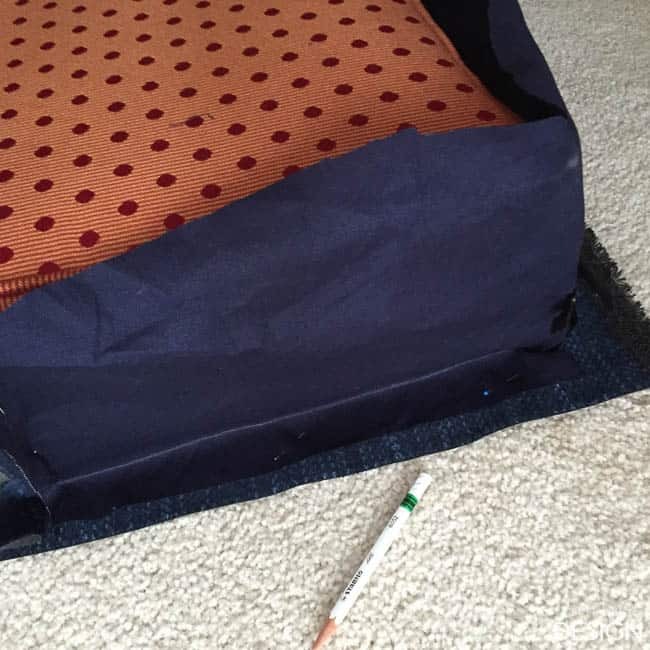 I did remove the fabric from the cushion here, simply by unzipping the cover. I did have to use more of the replacement fabric for the back of the cushion. 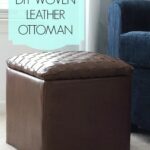 I’ve included a great video resource for sewing a box cushion, click here. While I’ve sewn quite a few boxed cushions in my lifetime, I am by no means an expert. To give the chair a more modern look, I left off the cording. And there you have it. 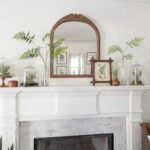 A cheater’s guide to re-upholstery! 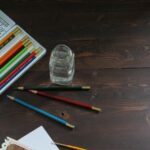 I know this still seems pretty daunting, but trust me these cheater steps do help move the process along! Wow! Great job! I don’t think you were cheating at all, just thinking outside the box! 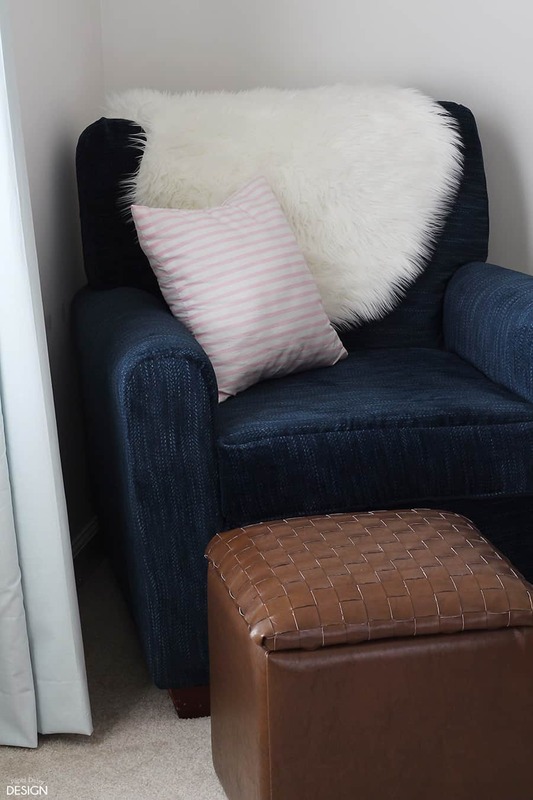 How much fabric in total would you say you needed to cover the whole chair? I can’t remember exactly now, but probably about 5 yards. I ended up being a little short. Becuase so much time had passed from when I first bought the fabric, I just had to find something that was close and use it on the cushion and the back. Good advice,an easier technique if starting with a chair in good condition. 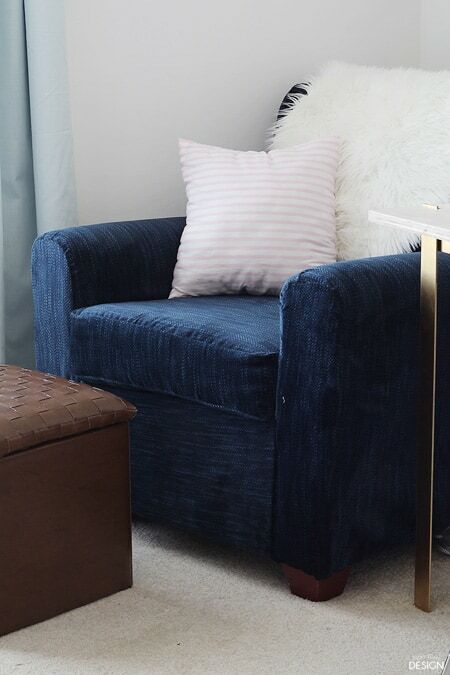 Using a coordinating fabric is great…sometimes used as a design feature OR to save $$ when a cover fabric is pricey. Also,if you are working with a large print it means a few less seams to match. My first recover project in the 70’s was to slipcover a three cushion sofa. 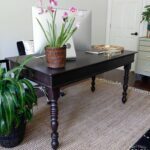 I used a bold floral chintz, did it with about nine yards of 58″ fabric. 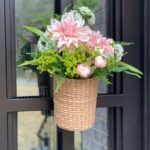 I had nothing but tiny scraps when done. I learned that it would have been easier to reupholster than all the fitting to make it removable and zipprt off. What an impressive job! I’m wondering why you didn’t remove the old fabric. 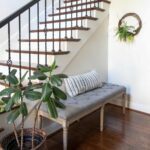 I’m asking because I have a leather couch which I would like to reupholster with fabric . But I wasn’t sure what would happen if I stapled the fabric on top of the leather instead of removing the leather first. Thanks for sharing. 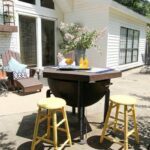 How many did it take you to complete this project? 1. Did you attend a course to learn how to put up the tapestry? 2. What kind of staple gun did you use? I’m interested in knowing if you used a manual or an electric one. As an woodworker i can say that, this is the ultimate use of brad nailer to decorate your home.